Solar-Powered Marines See Big Gains In Afghanistan : All Tech Considered U.S. Marines may be on the verge of turning a long-time enemy into an ally. In this case, that enemy is the desert sun. Thanks to flexible solar panels, the sun can help run military equipment -- and it may even cut down on casualties. 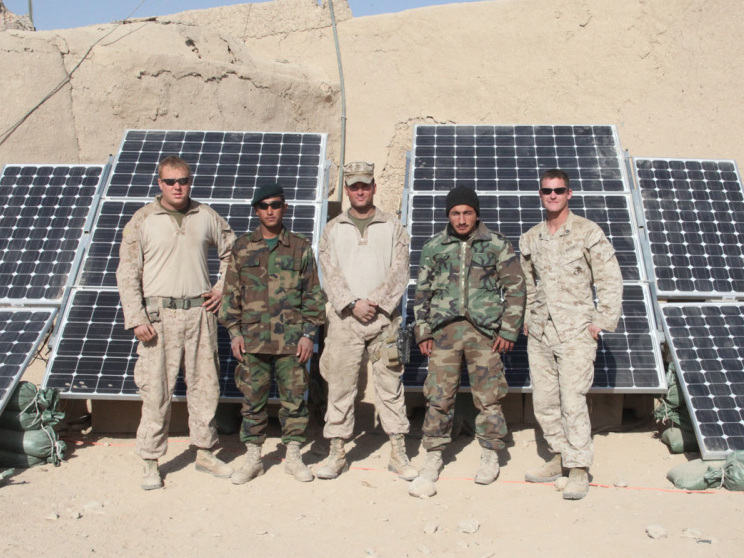 Solar panels like this modified ZeroBase Regenerator can provide power for more than 17 computers and 15 lighting units, according to Marines who tested the equipment in Afghanistan. U.S. Marines may be on the verge of turning a long-time enemy into an ally. In this case, that enemy is the desert sun. Thanks to flexible solar panels, the sun can help run military equipment -- and it may even cut down on casualties. By using solar power and placing an emphasis on energy conservation, Marines and sailors of 3rd Battalion, 5th Marine Regiment say they cut diesel consumption in their generators from 20 gallons a day to 2.5 gallons a day, according to a Marine report. The regiment tested the equipment in Afghanistan at the end of last year, in what may be the first large-scale military test of solar power there. Fewer Supply Convoys -- With less need for fuel and batteries, fewer trucks are exposed to possible attacks on the road. Quieter Is Safer -- Units that rely on diesel generators to keep equipment running at night could go quiet while running on batteries, making them harder for the enemy to find. Efficiency -- The foldable solar blankets are light and don't take up much space. That should help patrols' mobility, and save space for other supplies -- like ammunition, as one sergeant says. That all sounds great -- but another report, from a Marine training exercise here in the U.S., adds a different perspective. To work properly, the solar panels needed bright sun -- something that was less abundant in the test areas of Virginia than in Afghanistan. An eight-hour charge for a single AN/PRC-119F SINCGARS radio battery took between three to four hours, which makes this an unrealistic option for Marines on the move, said Sgt. Taylor Clark, a communications instructor with The Basic School in Quantico. "If you're on a patrol, you are not able to stop and set up for four hours; it's not very 'recon friendly,'" explained the Metairie, La., native. Clark mentioned that in order to keep the SPACES charging at optimal levels, it had to be continually rotated to keep it in direct contact with the sun as the day progressed. It also had to be kept completely free and clear of sand, which can be time consuming and tedious when in a desert, he said. Still, the recent tests showed that using alternative energy on military missions has both tactical and environmental benefits. And in both the Virginia and the Afghanistan tests, Marines praised the panels for being durable, light and simple -- kind of the trifecta for field gear. Just in case your appetite for Clancy-esque military-speak hasn't been sated, here's a last soupcon: The so-called Solar Portable Alternative Communications Energy System (SPACES) was deployed in a new program called ExFOB -- that's Experimental Forward Operating Base to you. ExFOB has provided immediate energy to my boys," said Gunnery Sgt. Willy Carrion, 'I' Company, company gunnery sergeant. "Logistics and resupply to my men is essential to our mission accomplishment. Marines can sustain themselves on little food and water, but the time we have saved on convoys for fuel and batteries, has been crucial. Thanks to Kevin Bullis at Technology Review for first spotting this story.